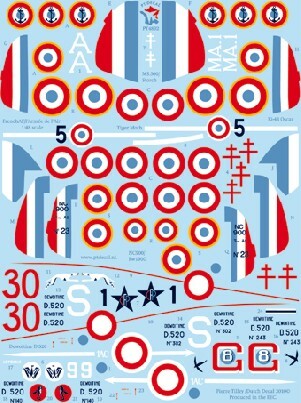 This is an excellent decal sheet produced by PT decals in 1/48 Scale depicting French Air Force Dewoitine 520, Morane Saunier MS 500, SNCAC 500, DH-82 Tiger Moth and Nakajima Ki 43. The decals are superbly printed by Dutch Decals with good colour saturation and excellent register. As usual the carrier film is ultra thin and my experience with Dutch Decals that I have used in the past is that the decals will snuggle down into the surface detail well. Dewoitine D.520 Serial No 302.S of GC III/6 flown by Capitaine Bernache-Assolant June 15 1940. The aircraft is finished in Dark Blue Grey, Green and Dark Earth upper surfaces and Light Blue Grey under surfaces. The French cocarde (C) is in 6 positions and the rudder is in the usual red/white blue national colours. Dewoitine D.520 Serial No 208.30 of GC II/3 flown by Sergeant Robert Killy in June 1940. The aircraft is finished in Dark Blue Grey, Green and Dark Earth upper surfaces and Light Blue Grey under surfaces. The French cocarde (C) is in 6 positions and the rudder is in the usual red/white blue national colours. Dewoitine D.520 Serial No 140.9 of Escadrille 1AC Oran La Senia in late 1940. The aircraft is finished in Dark Blue Grey, Green and Dark Earth upper surfaces and Light Blue Grey under surfaces. The French cocarde (C) is in 6 positions and the rudder is in the usual red/white blue national colours. Dewoitine D.520 Serial No 548.1 Group Dorset Tarbes-Ossun in August 1944. The aircraft is finished in RLM 74/75 upper surfaces and RLM 76 under surfaces. 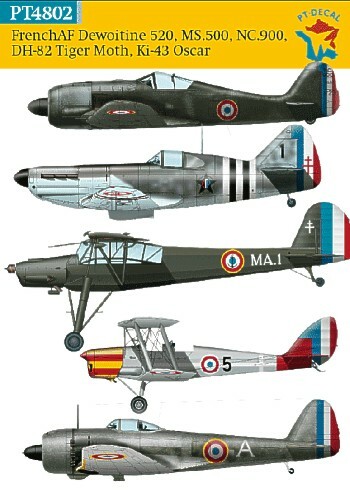 The French cocarde (C+4) is in 4 positions and the rudder is in the usual red/white blue national colours with the cross of Lorraine painted on the white stripe. The aircraft has 10-15 cm black and white stripes painted on the fuselage and the upper and lower surfaces of the main wings. Dewoitine D.520 Serial No 234.G8 flown by Capitaine Justin Gisclon in summer 1945. The aircraft is finished in RLM 70 or 71. The French cocarde (C) is in 6 positions and the rudder is in the usual red/white blue national colours. Morane Saunier MS.500. Serial No MA1 Criquet of No 2055 Mobile Base in Indochina in late 1949. The aircraft is finished in overall RLM 70 or 71. The French cocarde (A) is in 6 positions and the rudder is in the usual red/white blue national colours. SNCAC NC.900 Serial No 23 of GC III/5Normandie-Niemen Toussus-le-Noble in 1946. The aircraft is finished in overall RLM 70 or 71. The French cocarde (S) is in 4 positions and the rudder is in the usual red/white blue national colours. DH-82 Tiger Moth Serial No 5 of Escadrille 2/595 at Tong in Indochina in 1941. The aircraft is finished in overall aluminium finish. The French cocarde (C) is in 4 positions and the rudder is in the usual red/white blue national colours. Nakajima Ki.43-111a Serial No A of GC I/7 Provence based at Phnom Penh Cambodia in December 1945. The aircraft is finished in bare metal with very faded Imperial Japanese colours. The French cocarde (B) is in 4 positions and the rudder is in the usual red/white blue national colours.